Read a preview of Batman and Robin, starring Bruce Wayne's ninja assassin son! One of the newer cast members in the Batman comics is Damian Wayne, Bruce Wayne and Talia al Ghul's semi-sociopathic offspring. Since his birth, Damian has been trained in the art of murder by the League of Assassins. Damian's mellowed considerably since taking up the mantle of Robin, but he's still a pint-sized rebel. 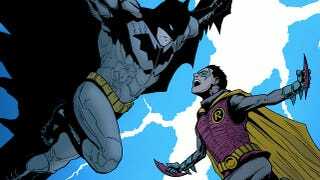 In this exclusive sneak peek of the next issue of DC Comics' Batman and Robin, Damian's run away from Wayne Manor and teamed up with NoBody, the vigilante son of Batman's mentor Henri Ducard. It's a far cry from toilet-papering Commissioner Gordon's house. As the bond between Batman and Robin deteriorates, Robin is forced by NoBody to make a life and death decision – and Batman's hunt through Gotham City to find them reaches a soul-searing moment that will push Batman to the edge!